LAS VEGAS - With the lighting of its new marquee and hotel tower signs, Monte Carlo officially shed its name this week for a new identity – Park MGM – making way for the resort set for completion later this year. Following a transformation that will touch every element of the central Strip property, Park MGM is a welcoming social hub that evokes the residential spirit, intimacy and individuality of a boutique experience on a resort scale. 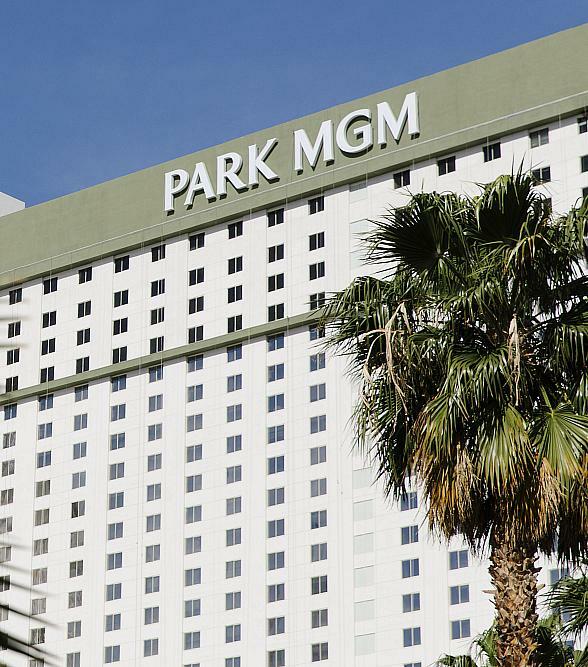 A partnership between Sydell Group and MGM Resorts International, Park MGM was born from the collaborative vision of the New York-based lifestyle hotelier and one of the world's preeminent destination resort developers. When complete, the project will comprise two new distinct experiences: Park MGM, and a Las Vegas version of the renowned NoMad, a standalone 292-room hotel encompassing the tower's top four floors. "It's a very special moment seeing this ambitious idea begin to come to life," said Andrew Zobler, founder and CEO of Sydell Group. "Together with MGM, we were able to rethink every element of the guest experience and create something personal on a grand scale." Jim Murren, Chairman and CEO of MGM Resorts, said, "The opening of Park MGM, and soon NoMad, will tie together the entire neighborhood we've created with The Park, T-Mobile Arena and CityCenter. We are grateful to Andrew and the team at Sydell Group for sharing our vision to deliver a destination that embraces its surroundings and speaks to a new generation of travelers." Beginning with the opening of the 5,200-seat Park Theater in December 2016, the resort has unveiled several new amenities including completely reimagined guestrooms and suites, food and beverage offerings, lounges, pools, meeting spaces and more. 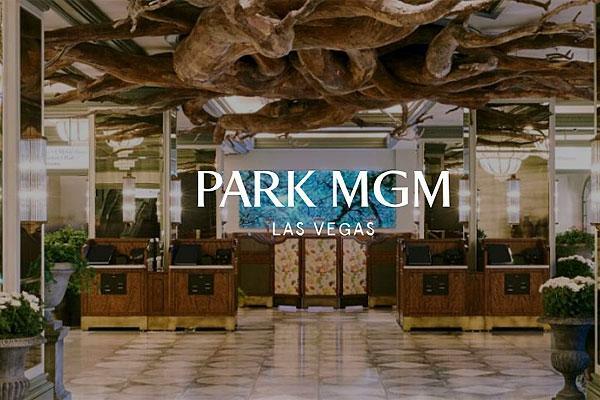 The evolution of the Park MGM experience will continue throughout 2018 with the addition of nightlife; a new dining concept from Roy Choi embracing the energy of Los Angeles' Koreatown; an Eataly marketplace designed specifically for Las Vegas; and the launch of Lady Gaga's highly anticipated special engagement, among other elements. NoMad Las Vegas will open within Park MGM in Fall 2018 with 292 guestrooms and suites; a dedicated entrance and lobby; high-limit gaming; a private pool environment; and the Las Vegas debut of Chef Daniel Humm and restaurateur Will Guidara, the visionaries behind the world's best restaurant, Eleven Madison Park. Immersive Lobby: Filled with natural light and punctuated by nature-inspired decor and art, Park MGM's lobby is a nod to urban gardens and parks, including the adjacent Park neighborhood, bringing the outdoors inside. A dramatic arboreal sculpture by Brazilian woodworker Henrique Oliveira is the focal point of the lobby. The remarkable tree sculpture extends from above with its roots stretching across the ceiling. Throughout the lobby, guests are invited to explore intriguing works by the likes of David Hockney, Shahram Karimi and Shoja Azari, and many others. Residential Guestrooms: Park MGM's rooms evoke the essence of a private apartment with a mix of thoughtful touches, antique-inspired pieces, 'found' objects and original artwork by artists and photographers from around the world commissioned for each room by France's be-poles studio. Primrose Restaurant: Located adjacent to the lobby, Primrose is inspired by the South of France and features an all-day menu with an emphasis on open-fire cooking. The restaurant celebrates the spirit of dining in a private Provencal garden with wood-fired grilling and an herb-centric cocktail program. For guests looking to dine al fresco, Primrose offers a spacious outdoor terrace overlooking the pool, beautiful both by day and night. Bavette's Steakhouse & Bar: The heralded Chicago-based Hogsalt Hospitality serves up steakhouse fare with a dash of French flair including seafood towers, flavorful bone-in dry-aged ribeye, sumptuous side dishes and house-made desserts. Classic cocktails and a well-curated international wine list embody Bavette's timeless vibe. For those in the know, Bavette's features a hidden speakeasy-style lounge at the back of the restaurant offering a full menu and bar, and the ultimate in intimacy and seclusion. Juniper Cocktail Lounge: This stylish lounge challenges the status quo of mainstay drinks while staying true to the foundation of what makes a great cocktail. Whimsical elements like fortune-telling Gin & Tonics come to life through house-made juices and syrups, a premium selection of spirits and an intense dedication to the craft. An eclectic soundtrack creates a sophisticated atmosphere that evolves throughout the evening. Moneyline Sports Book & Bar: Moneyline brings a new twist to the Las Vegas sports book with intertwining spaces that playfully transport guests to their favorite neighborhood hangout. Among the duckpin bowling lanes and billiards games, Moneyline features a menu conceptualized by Hogsalt Hospitality with griddled cheeseburgers as well as self-service, weigh-and-pay food selections for guests wanting to personalize their game-day feast. Pools: Channeling the sundrenched South of France, this vibrant outdoor escape features three pools, an oversized heated spa, 12 cabanas, lounge areas and multiple bars serving up delicious bites and beverages. Guests can mingle among friends at one of three pools – the South Pool, the East Pool or the North Pool – while lively music evokes a cool, laid-back vibe. Each pool boasts Baja shelf seating and submerged wet decks; a VIP area by the East Pool also features deluxe cushioned chaises. Meetings & Conventions: Phase one of Park MGM's 77,000-square-foot conference center combines non-traditional spaces and flexible design to fill an unmet need for small groups visiting Las Vegas. With bookings now available, meeting planners can take advantage of the city's first Executive Meeting Center and a comprehensive installation of Stay Well rooms and meeting space. Casino Floor: Park MGM's remodeled casino floor reflects the resort's outdoor inspiration. In keeping with Sydell Group's vision for maintaining key elements of the former space, the casino's design contains subtle nods to its Monte Carlo roots, including the refined sparkling chandeliers, intricate crown moulding and stained-glass ceiling, all of which have been refurbished to their original beauty. Park Theater: Park Theater invites guests to an intimate space for one-of-a-kind productions from renowned artists. The theater is home to extended engagements with Bruno Mars, Cher, Ricky Martin – and soon – Lady Gaga. With its unrivaled central location, Park MGM offers guests direct access to what is quickly becoming the city's premier entertainment district, featuring T-Mobile Arena, The Park and Park Theater. Αναρτήθηκε από geop στις 10:23 π.μ.